If the walls of The World Bar could talk, they would have so many stories to tell. Back in the day, the four-story Victorian terrace was a house of ill-repute, a gambling den and the headquarters of Aussie rock legends INXS. With such a storied past there is no way The World Bar could go about its business and be just another regular nightclub. It is an eccentric space with scores of hidden cubbies and a labyrinth of interconnected rooms. Patrons can grab a seat in these areas, a booth or along the massive, beautifully accented terrace. Today, as international and local indie bands and DJs provide the soundtrack for the exciting nights at The World Bar, customers can order delicious burgers or pizzas from their menu or sip on an adult beverage from the bar. The World Bar is now infamous for their line of "teapot cocktails". That's right. Want to pour long island ice tea out of a ceramic teapot like a proper lady or gent? Well for around $20 you can. If the Mad Hatter's tea party served up drinks like this, it's possible that the event would have been... well, madder. Happy hour at The World Bar is from 5-7pm where you can snag $5 spirits, beers and wine, and cocktails are $12 from 7-9pm every day of the week. 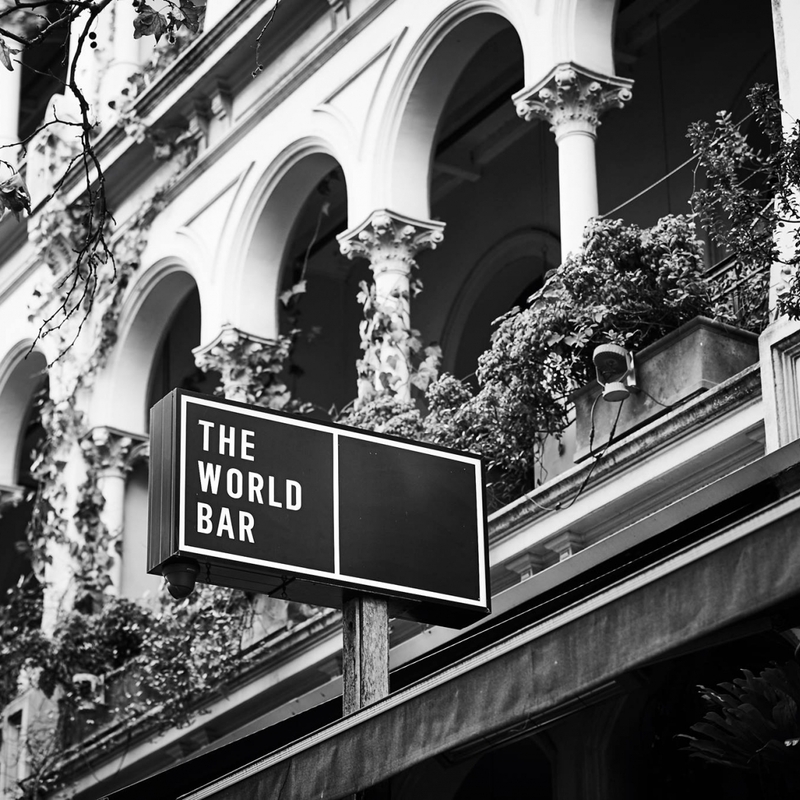 The World Bar is a one-stop shop for a night of entertainment, but being in the Kings Cross neighbourhood means that you will be surrounded by more restaurants, clubs and bars that your tired dancing feet can take you too. If taking the train, get off at Kings Cross Station. The World Bar will be a minute walk away. If travelling by bus, take route 200, 324 or 325 and get off at Kings Cross Station which will place you a minute away from the venue.